THE TOLL IN the deadliest wildfires in recent California history climbed to 59 yesterday as authorities released a list of 130 people still missing. Butte County Sheriff Kory Honea told journalists yesterday evening that 461 search and rescue personnel and 22 cadaver dogs were involved in the effort to locate those missing and DNA testing was being expedited to identify the victims. Paradise, a town of around 26,000 in the foothills of the Sierra Nevada mountains, was popular with retirees and many of those reported missing by the sheriff’s office are elderly – in their 70s, 80s and 90s. Virtually every home in Paradise, located 130 kilometres north of the state capital Sacramento, was destroyed by the fast-moving fire fueled by high winds. 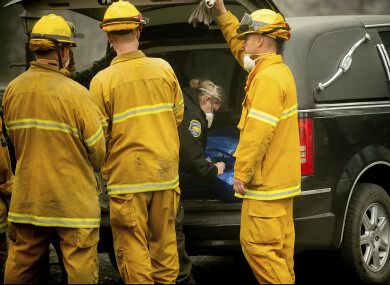 At least 59 deaths have been reported so far from the devastating wildfires and body recovery teams were going house-to-house with cadaver dogs in Paradise yesterday. You’re not going to be able to rebuild Paradise the way it was. The complaint alleged that the fire began on 8 November when a high voltage transmission line failed, igniting a vegetation fire. Allyn Pierce, a nurse in Paradise, told The New York Times and CNN how his life was saved by a bulldozer driver as he fled the town in his pickup truck along with other residents last Thursday. Pierce said that cars were catching fire around him and he dictated a goodbye message to his family, expecting his vehicle to catch fire next. Then all of a sudden this bulldozer comes out of nowhere and knocks this burning truck out of the way. The “Camp Fire” has ravaged 135,000 acres of land and is 35% contained, according to the California Fire Department. The “Woolsey Fire” has razed 97,620 acres and has been 47% contained. The Fire Department has said that more than 3,500 fire personnel were battling the “Woolsey Fire,” which has destroyed the Malibu homes of several celebrities including Miley Cyrus, Neil Young, Robin Thicke, Shannen Doherty and Gerard Butler. Email “Death toll from California wildfires rises as 130 people still missing”. Feedback on “Death toll from California wildfires rises as 130 people still missing”.